If your cat has sensitivities, finding a food that they enjoy and that is gentle enough of their stomach can be difficult. You want your cat to enjoy mealtimes, and you can accomplish this with the best cat food for sensitive stomach. We've picked five quality brands and wrote mini-reviews of each one to allow you to compare them side by side. Before we get to the reviews, we're going to outline what to look for in your cat's food, why some cats have sensitivities, and more in our buyer's guide section so you can buy with confidence. What is Sensitive Stomach in Cats? Allergies - Cats can have food allergies just like humans can, and eating the foods that cause the allergic reaction can cause sensitivities. It can cause itching, a dull coat, vomiting, gas, bloating, and pain. Diet Changes - Younger cats can have sensitive stomach due to the fact that they're still developing, and diet changes can cause an upset stomach for a few weeks. This is why you're supposed to gradually transition your cat from one food to the next over the course of a week. Feeding Behavior - As your cat gets outside and hunts like cats naturally do, they can eat a lot of things that can upset their stomachs. This can make them more sensitive to the food they eat, and you can find it difficult to feed them something that won't cause them to throw up. Hairball - If cats tend to eat a lot of hair from grooming, it can actually shift how their system digests food. This can result in more throwing up because it's easier for the cat's system to get rid of the hairball this way rather than passing it. Additives include things to make your cat's food last longer than it should, and that enhance the color so you buy it. 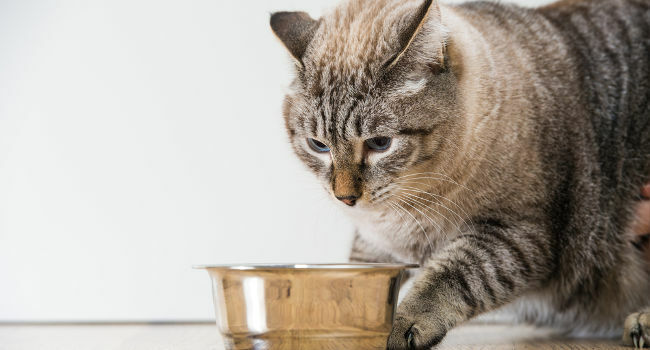 Your cat's system can't break down these additives, and it can cause constipation, diarrhea, vomiting, bloating, gas, and more if they eat a commercial food full of artificial colors, flavors, or preservatives. Beef is an extremely popular protein source in both cat and dog foods, but some cats have problems digesting beef, and it upsets their stomachs. If you think beef or red meat is the cause of your cat's digestive sensitivities, you can switch out the protein source to chicken, turkey, or fish and see if it improves. Dairy products contain lactose, and your cat's system isn't designed to absorb or break down lactose without having problems. You can switch to a dairy-free cat food and monitor your cat's digestive health. If this is the problem, you should see their symptoms clear up. If a lot of fat trimmings make their way into your cat's digestive system, they have to produce more bile in order for their digestive system to break it down. This can result in your cat vomiting. If they can't produce enough bile, the fat trimmings turn into diarrhea. Glutens and grains are common filler ingredients that manufacturers use to bulk up the cat food formula. However, they also take a longer time to break down than they get in your cat's system when they eat it. Giving your cat a food rich in grains can cause abdominal pain, diarrhea, and vomiting. Fewer Treats - Double check your cat's treats if you're feeding them a sensitive stomach diet because the richer content in the treats can cause stomach upset. You should never feed your cat more than 10-percent of their daily diet in treats. Hydrate - Even if your cat eats primarily wet food, they should have constant access to fresh water to ensure that they stay hydrated. Your cat needs between 3.5 and 4.5-ounces of water per pound of body weight per day. Reduce Stress - Stress can have a negative impact on cat, and it can make them more prone to throwing up or not feeling well. Try to reduce their daily stress levels. You could even feed them in a quiet environment and see if it helps. Never switch your cat's food without slowly transitioning them to it over the course of a week or 10 days. For the first two days of the switch, remove 25-percent of your cat's normal food and replace it with the sensitive stomach formula. When day three and four come about, your cat should eat an even split of the sensitive stomach food and their regular food at every meal. Days five and six should be 75-percent sensitive stomach food and 25-percent old food. The seventh day should finish the transition with 100-percent of the food being the sensitive stomach food. Hill's cat food contains a specially balanced formula that comes designed to improve your cat's skin and coat while being gentle enough for sensitive stomachs. It has a blend of fatty acids that help to nourish your cat's skin and ensure a healthy coat. There is a clinically proven antioxidant blend that has vitamins C and E to support a healthy and regular digestive system and immune system. The food has easy to digest ingredients that allow your cat to eat them without having discomfort, bloating, or gas afterword. Your cat will enjoy an exclusive blend of antioxidants, vitamins, minerals, and amino acids to support optimal health throughout their lives. There isn't any artificial flavoring, artificial colors, or artificial preservatives in this food, and this reduces the risk of setting off abdominal discomfort or problems. Cat parents who had cats with sensitivities liked this egg and rice formula combined with the smaller kibble because it was easy for their cats to eat and digest. Cat parents who bought this food did say that it has a very carbohydrate-heavy formula that could cause weight gain. This chicken and brown rice formula also contains quality ingredients including sweet potatoes, blueberries, cranberries, peas, carrots, and flaxseed. Real meat is on the label as the first ingredient, and the chicken is a lean protein source for your cats. Your cat will get a specially formulated food that contains a good level of probiotics that help to ensure digestive health and healthy bacteria levels. Each bowl gets a serving of LifeSource Bits that contain a special blend of vitamins, minerals, nutrients, and antioxidants that support digestive and immune system health. The entire formula is healthier, and it contains no chicken or poultry by-product meals, soy, corn, or wheat. Additionally, this food doesn't have any artificial preservatives, flavoring, or colors for an overall healthier formula that is easier on your cat's sensitive digestive system. People who bought this sensitive formula cat food for their pet liked that it contains LifeSource Bits that give the food a boost of antioxidants, vitamins, and minerals. People who bought this formula did say that it can cause their cat to have a very strong-smelling breath. Purina Pro Plan's sensitive skin and stomach food comes in three different flavors and seven different styles that lets you pick one to suit your cat's eating habits. Real meat is the first ingredient listed on the bag from a trusted source. Your cat will enjoy a formula that is rich in vitamins, nutrients, fatty acids, and zinc that help to support healthy skin, a shiny coat, and digestive health. It also contains natural prebiotic fiber that helps to keep your cat's digestive system regular each time they eat. There is a higher protein content in this formula that helps to support lean muscle growth, a healthy immune system, a healthy digestive system, and a nourished digestive tract. The oat and rice meal in this cat food is easier for your cat to digest than other ingredients. Cat owners who bought Purina Pro Plan's formula liked that it came with a higher level of prebiotic fiber for healthy and regular digestion. Cat owners did point out that this food can have a stronger smell when you first opened the be that can linger for a few days. You can buy three different quantities when you buy this wet cat food, and the thin slices are good for cats who are over a year old with digestive issues. It features an optimal blend of vitamins and nutrients that help to support optimal health throughout your cat's life. The formula helps your cat maintain an ideal and healthy weight, and it doesn't contain a lot of carbohydrates to encourage weight gain. The slightly higher protein content helps to support lean muscle growth and maintenance, a higher energy level, and healthy growth. You can feed your cat this cat food by itself each day, or you can pair it with the dry kibble for a balanced and healthy meal. The highly digestible protein is very easy on your cat's system, and it comes with a gravy that is also highly digestible. Cat parents who bought this canned cat food were happy that they could mix it with the dry kibble to give their dog a balanced and healthy meal. 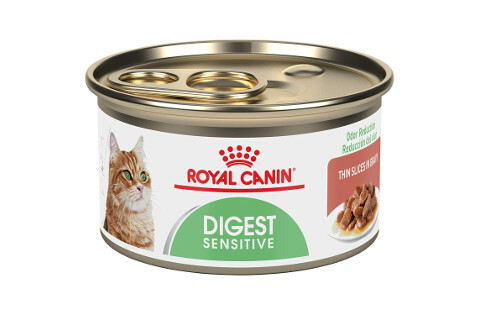 Cat parents were not happy that you feed a typical adult cat over three cans of this food every day because it's more expensive. 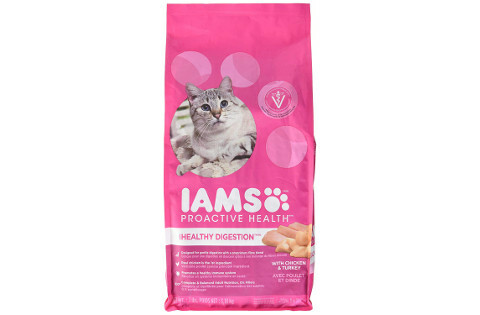 This cat food by Iams has a very protein-rich formula that has easily digestible proteins that are easy on your cat's sensitive stomach. 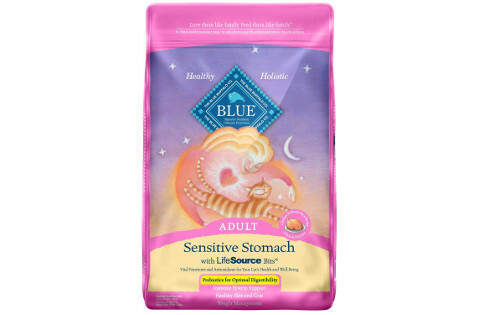 It has supporting ingredients that help to support long-term digestive health, even in cats with extreme sensitivities. The tailored prebiotic blend contains beet pulp and prebiotics that help to ensure that your cat's digestive system stays regular. It also works to help your cat's digestive system absorb all of the nutrients from the food they eat for a healthy and nourished cat. The smaller and crunchier kibble pieces work to clean any plaque or buildup from your cat's teeth, and this can help them have better dental health overall. The formula comes enriched with a healthy blend of antioxidants that help to support cell repair, a healthy immune system, healthy muscles and bones, and a healthy digestive system. Cat parents who bought this food for their cats were pleased that it has formula that is very rich in protein to support lean and strong growth. Cat parents were not pleased that this food may not be gentle enough for cats with very sensitive stomachs. What's the Best Cat Food for Sensitive Stomach? 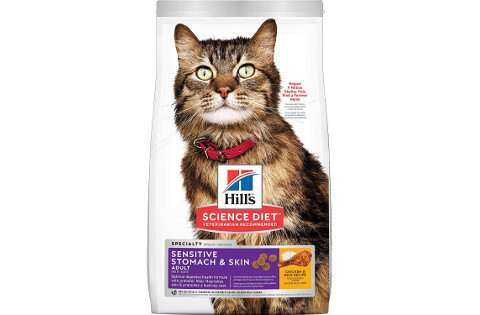 Our pick for the best cat food for sensitive stomachs is Hill's Science Diet Sensitive Stomach And Skin Dry Cat Food because it's gentle enough for sensitive stomachs while still supporting your cat's healthy skin and shiny coat. It comes with a clinically proven antioxidant blend that gives your cat's immune system a boost each time that they eat it. We picked it because it has an exclusive rice and egg formula combined with smaller kibble that was easier for cats of all ages to eat. Finally, we liked this choice because the vitamins, minerals, antioxidants, and fatty acids support optimal health throughout your cat's life.